But pro sports teams weren’t the only ones with memorable moments in sports this past year. Hudson Catholic’s sports teams also experienced some of these special moments. We decided to list the top five sports moments at Hudson Catholic during 2018. Note: This list is not in order from best to worst or worst to best; it is in chronological order. The Hawks saw a few championships early in 2018 when winter sports teams Boys Bowling and Girls Indoor Track & Field both won their respective Hudson county championships. 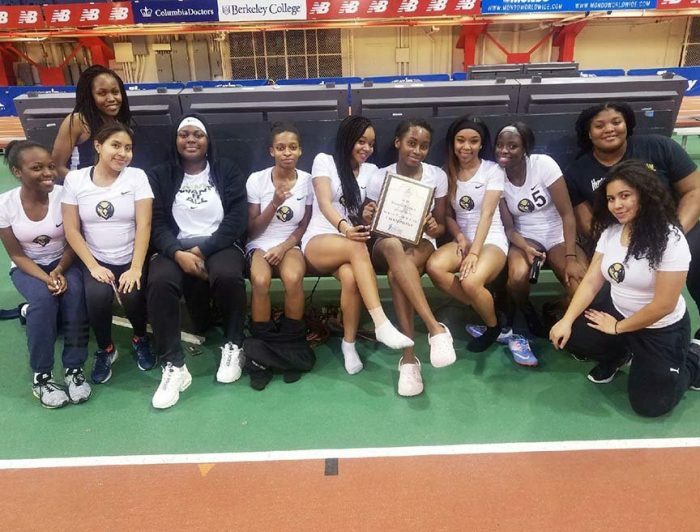 The track team won the championship when they overcame the North Bergen Bruins who earned 54 points at the event by getting 56 points overall. The bowling team also had to overcome the Bruins, who they beat in two games, to win their championship. “It was an exhilarating moment,” senior James Pabilonia commented when asked how it felt helping his team win the championship. 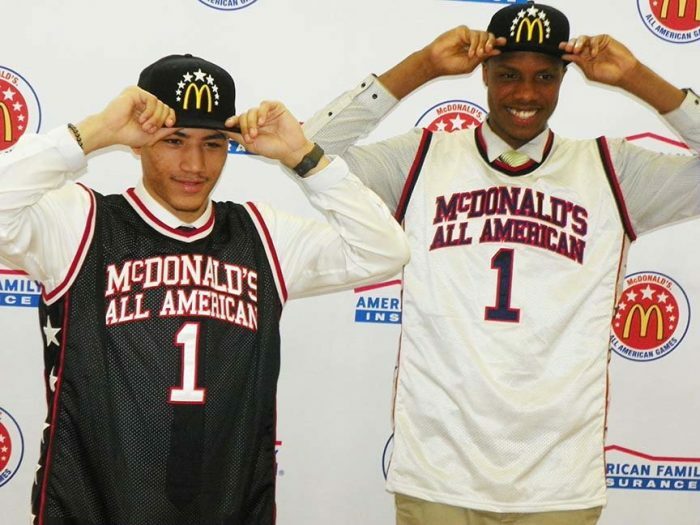 It was a huge moment in not only 2018 but also Hudson Catholic history when not one, but two, players from the Boys Basketball team were selected to play in the McDonald’s All-American Game. The game sets a stage to highlight the best boys and girls basketball players in the nation each year. The two boys, Jahvon Quinerly ’18 and Luis King ’18 were two of only three students selected from New Jersey. To add on to that, they were the only two students from the same high school to be selected to play in the game, so the accomplishment was a huge one. With the help of our current Assistant Principal, Mr. Terence Matthews, rugby has become a fairly popular sport at our school the past few years. And while the school had only had a boys team, with the interest of the sport growing, that changed in 2018. During the spring season, Hudson developed their first official girls rugby team, who participated in their first match at a tournament in Jersey City with teams from New York. Senior Arlette Huesca, one of the girls who played in the match, was the one scored the first points for the girls team in School History. “It was truly a surreal experience,” Huesca stated about the how it felt making history. From the time the current seniors were just freshmen four years ago, the Girls Volleyball Team has been a dominant force. 2018 wasn’t any different for the team who were not only top contenders in the county once again, but top contenders in the state. The team lived up to their hype when they won their fourth consecutive Counties Championship. This was the first time a girls team won this many championships in a row at Hudson Catholic. “I’m glad I got to accomplish my four-peat with my girls,” senior Simone Abdullahi commented about the accomplishment. The girls coming back to play next year hope to continue this winning streak in 2019. These moments are ones that might have started in 2018, but they will continue into 2019. Students from the Class of 2019 have already begun to commit to colleges to play their respective sports. 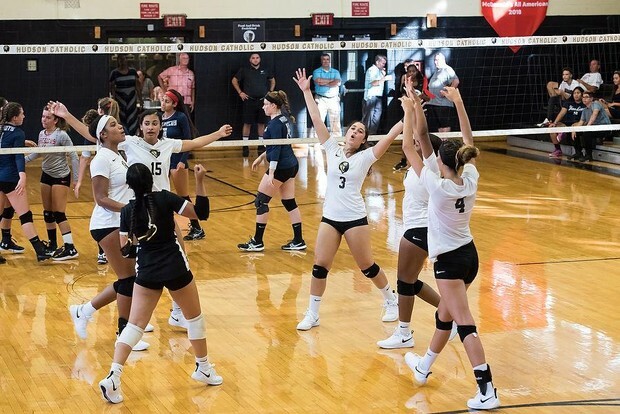 “I never thought that I would get to this point in my volleyball career,” senior volleyball player Kaylana Lee Chow stated after signing with Adelphi University. Some of the athletes that have signed are senior basketball player Daniel Rodriguez, senior baseball player Valentino Salgado, and senior football player Jaden Rolling. The teams of 2019 have a high standard they have to reach if they want to match 2018, but it’s only the beginning, and things are already looking good. Make sure to come out and catch one our many sports teams in action this year, Hawks!